10th February, Hakata, Japan: It was a big pay day for Amercian PBA pro, Tommy Jones and Singapore national bowler, Cherie Tan after their triumph in the International Bowling Championship 2012 supported by DHC, the WTBA World Tenpin Bowling Tour No. 4 stop. American PBA pro and No. 1 seed, Tommy Jones, who has taken 3 of his 13 PBA titles in Japan, thrashed reigning PBA Player of the year and current World Bowling Tour leader, Mika Koivuniemi of Finland, 290-204 to pick up the 6 million yen cheque. Koivuniemi beat third seed, Choi Bok-Eum of Korea, 226-211 to face the American while Choi ousted Malaysia’s Zulmazran Zulkifli, 241-198 to meet the Finn. 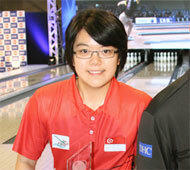 In the opening match of the stepladder finals, Zulkifli fell to No. 3 seed, Choi Bok-Eum of Korea, 241-198. Zulkifli struck on six of his first eight shots but suffered two open frames. Bok-Eum bowled a clean game including a four-bagger and a three-bagger to putt he match away well before the final frame. Cherie Tan, who was seeded second after the qualifying rounds, sailed past third seed and winner of the first TV shootout, Jeon Eun-Hee of Korea, 235-189 to earn a crack at the title. Jeon had earlier won the first match by Missy Parkin of USA, 224-206. The Singaporean had a faultless match against top seed, Dayang Khairuniza to take the match, 218-179 to win the women’s crown and the top prize of 6 million yen. Tan had three strikes-in-a-row while Dayang had three open frames. The International Bowling Championship 2012 supported by DHC was the fourth stop of the 2012 World Bowling Tour and offered total prize fund of 30 million Yen or more than 380,000 U.S. Dollars. Men and women competed in separate divisions. Each division consisted of 84 players - 45 local bowlers (15 each from three pre-qualifying tournament), the top 16 of the international trials (Feb. 7 and 8), as well as 23 seeded and invited players. 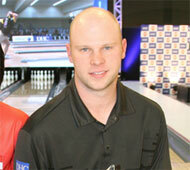 All 84 men and 84 women bowled nine games of qualifying divided into three blocks of three games. Based on the nine-game total, the top 24 men and the top 24 women advanced to the semifinals. Those 24 bowled another two three-game blocks on Friday with the pinfall from the qualifying being carried forward. The top 9 men and the top 9 women with the highest 15-game total qualified for the TV Finals. The top three in each division advanced straight to the TV stepladder finals on Saturday, while bowlers seeded fourth to ninth determined the No. 4 seed for the stepladder in a single-game shoot-out match. In the TV stepladder finals, which were broadcasted nationwide by NHK Global Media Services, Inc., were staged on specially constructed lanes in Diamond Hall on the second floor of the building. In the stepladder, the No. 4 seed bowled the No. 3 seed. The winner of the single-game match took on the No. 2 seed for the right to bowl the No. 1 seed for the title. The prize money for each division was the same, with the men's and women’s winner each taking 6 million Yen or more than US$77,000, with US$38,500 and US$19,250 going to the second and third place finishers, respectively. Photos courtesy of Hero Noda.